Testimonials for Paul's Pointing Inc.
Fairthorn Farm. Built by the great grandfather of Bayard Taylor, Fairthorn is the oldest house in the borough of Kennett Square. 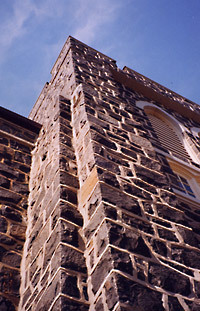 The stone construction dates from approximately 1790 and the brick section from about 1820. Paul's Pointing Inc. helped us to ensure that the house will last another 200 years. The full re-pointing of the stone and brick was accomplished expertly and with the care that the house deserves. Paul's advice on color and style detail was invaluable and has withstood the test of historians who have praised the effort. I don't think we have ever felt so satisfied with an investment in a home. Paul's Pointing Inc. came to us highly recommended. The praise was well deserved. Paul and his men re-pointed the stone portion (dating from 1790) and the brick portion (1820) of our historic home. We were confident when the job was being carefully done and that confidence has only increased as longtime admirers of the old house have signaled their hearty approval. Homeowner. We can't say enough about how pleased we are with the work that Paul and his crew did for us. the re-pointing looks wonderful. We were impressed with the care that was taken with our 100 year old house, the crew's attention to detail, and the professional way they did the work and cleaned up at the end of each day. Paul and his staff can take pride in their craftsmanship, finished product, and the way they made it happen - Great job! United Methodist Church of the Atonement. Just a note to let you know how much we appreciate the superb job you did pointing the stone on our church which was built in 1866. The procedure of removing the old joints, cleaning the areas, and reapplying the new pointing was most professional. it looks fantastic. Your group arrived at the appointed time and cleaned up the area when they left. We are very happy with the results. We only have three more sections to do, and as soon as out finances permit, I will call you. The Thomas Stevenson House. Just a short note to thank you and your men on a marvelous restoration at my home. the north and west walls plus the front steps match the rest of the home completely. Thank you again. I would like to thank you and your employees for the excellent repointing and sealing work in the basement of the historic Mount Pleasant Meeting House Parsonage house. After a walk-through with our Park’s Maintenance Superintendent and a board member of the Friends of Bellevue, both remarked on the high quality of the work and the cleanliness of the basement area. As you know, the Parsonage is an significant historic and cultural resource here at Bellevue State Park. You and your team’s attention to detail and professional workmanship will help to ensure that this important resource is preserved for many more years to come. © 2015 Paul's Pointing Inc.